From the moment you begin your search for another dog and decide you want to help a homeless dog you can be filled with hopes and dreams. Browsing many websites to contemplate different breed mixes expectations get raised. When completing the Homing Questionnaire you are asked to answer very real questions and are reminded how responsible dog ownership needs to be. We will then hopefully have some suggestions for dogs which will match your lifestyle. Offering an Am Bull its home needs careful consideration; dog ownership experience and a simple lifestyle is a must. We have offers where we step back and say ‘Wow! That is a big ask of our dog!’ We are obviously looking at what you can offer our dog and need you to turn your vision so it’s not what they can offer you. A rescue American Bulldog needs time to find their feet and build up trust relationships. They need your support, patience and understanding. Rescue Remedies has a lot of experience with Bull Breeds and in particular have successfully helped many American Bulldogs find their responsible families. We mainly deal with council pounds ‘abandoned on the streets or owners pretended that to be the case’ and a dog hasn’t been claimed and has maximum one or two days. On meeting an American Bulldog you are aware of their presence, size, power, friendliness and how much you need to stand firm to be a rock for them. Your support devolves their instincts so they don’t need to protect and, even worse, possess. You need to supervise their introductions on all occasions and help people to be alert to their needs and help them to settle and trust new people. This is a lifetime role you play with your Am Bull. You cannot have friends just drop in to borrow items when you aren’t around. You can’t risk a gate being left open or a casual front door routine which could allow your dog to venture further without you. So when meeting an American Bull dog first look to put them at their ease and they will begin to accept your guidance. The person introducing you will start off walking and then gradually you will take over the lead and direct their attention to you and allow them to smell you, experience you; offered hand and gentle stroke in close physical proximity. Usually we walk alongside another dog once you feel comfortable, keeping a natural distance to see ‘your’ dog comfortably meeting other dogs and awareness around cars etc. American Bulldogs rarely lunge but can if they are unsure and need to be reassured and settled for example seeing a horse or walking down a busy street with lots of people walking fast past them. So learn to read their body language. Your expectations of the breed will allow you to rightfully manage your dog. If your expectation of an American Bulldog is to be open and friendly with all people and other dogs, not to react to shouting or a challenge of another dog or be pulled around by children who pinch when you’re out of sight to test them out – No! When homing an American Bulldog you will need to first and foremost respect the breed. You need to know they can be a little guardy and you have to work in with them so that they trust you and respect you at all times. Large dog people learn how to command that respect through their voice and stance, which isn’t demeaning or challenging to their dog but impresses authority and so they are naturally deferring to your command. They check you out for your reactions, comfort level, and relax down accordingly. As with all Bull breeds we never play ‘tug’ or teach them to match their strength to humans or other dogs. We teach tolerance and stretch them so they ‘allow’, ‘accept’ and stay within known rules and boundaries. For toys, they need robust rope type toys or kongs to chew or retrieve. Check they don’t become possessive as with any dog, and if precious, work with this so they learn to feel less precious either by offering ‘another and another’ termed flooding or respect their space and don’t challenge them by attempting to take, but attract them into another activity when they are more satiated. Testing a dog out by playing with food etc. isn’t wise and doesn’t make sense, in the same way as someone playing around with your food. If you need to ‘test’, test by using a long spoon and place more food in the bowl making it clear what your intentions are. 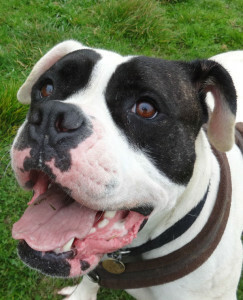 To adopt one of our Ambulls you must first complete our Homing questionnaire. Read the questions and understand the facets of your life which affect and will be affected by the type of dog you own. Check the lease with your landlord does it mention a dog as we will need to see this and check via telephone as it may be read differently with regards to the age of the dog? Check your garden boundaries and gate locks. Begin to list items you will need. You don’t need anything expensive especially in the beginning. Two marked cereal bowls; a single duvet with a cover folded in four will serve as a bed; a car harness or travel crate; good quality foods. Don’t buy the supermarket own brands or cheap foods or cheap coloured treats. Dogs don’t cost a lot to feed but giving them loads of colorants is likely to cause behavioural problems as it does with children if you give them lots of artificial colours. We may have a harness and extender lead for walking we can sell you, so it is the right sort (we then buy a replacement). People often come with them and we raise our eyes as they are not what we would recommend or they are the wrong fit. Finally ask if your vet does a saving or insurance scheme or make enquiries with insurance companies so that you have a quote ready to put into effect when you take your dog home.